United Bank of India Recruitment 2016 : United Bank of India has released a notification for the recruitment of 100 Probationary Officer Post. Those candidate who are waiting for UBI Vacancy should apply online application on or before the last date 12.07.2016. Candidates can check United Bank of India Recruitment 2016 notification from the official site at www.unitedbankofindia.com. United bank of India (UBI) has published notification for recruitment of 100 Probationary Officer posts in JMG Scale I. Candidate should not miss this golden opportunity. Applicants who want to apply are advised to read carefully the eligibility criteria mentioned in the notification. Candidate can know the details like Educational Qualification, age limit, Pay Scale, Application fee, how to apply and other information from this page. Application mode : Online mode. UBI PO Vacancy Educational Qualification : Contenders must have completed Bachelor’s / Master’s Degree in relevant trade or equivalent qualification. Candidates should have done qualification for United Bank of India PO Recruitment 2016. Age Limit For UBI Probationary Officer Post : Applicants age must be in between 21 years to 30 years as on 01.06.2016. Age relaxation will be applicable for Reserved category candidates as per norms of UBI Bank. 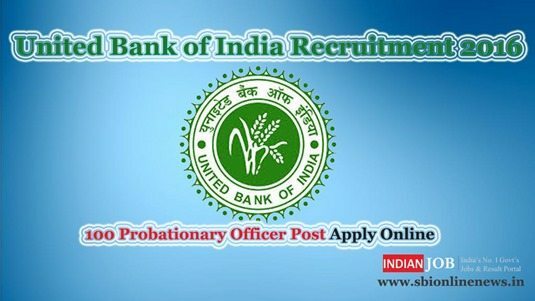 UBI PO Recruitment Application Fee : General and OBC category candidates need to pay Rs. 700/- and SC, ST, PWD category candidates need to pay Rs. 150/-. The Application fee should be pay through Online mode during filling Online Application Form. The Online Payment using Net Banking / Debit Card / Credit Card (OR) Bank Challan. United Bank of India PO Vacancy Pay Scale : Candidates will be paid Rs. 23700 – 980/ 7 – 30560 – 1145/2 – 32850 – 1310/7 – 42020/- will be paid for United Bank of India Recruitment 2016. Selection Process For United Bank PO Vacancy 2016 : Candidates will be selected based on performance in written Examination & interview conducted by United Bank of India (UBI). Candidates who are eligible and interested in United Bank Recruitment, they are required to submit the United Bank Online Application Form 2016 online from 28th June to 12th August 2016. Application form completely filled in all respect should be send in the online mode before the last date. Candidates can visit to the official website. If you are eligible than click on “Apply online” link. Fill online application without any mistake. Upload scanned photo & Signature in form. Deposit application fee & click on submit button. United Bank of India Recruitment 2016 for 100 Probationary Officer Post. Candidate can apply the United Bank Online application form on or before the last date 12 July 2016.